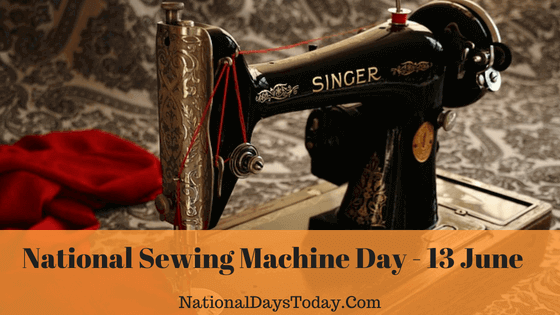 National Sewing Machine Day - Things Everyone Should Know! Celebrated on June 13th every year. The day is celebrated to honor the invention of the Sewing machine. When the people suffered by stitching their clothes on hand. The National Sewing machine day is celebrated to honor the invention of the Sewing machine. When the people suffered by stitching their clothes on hand since it required loads of work and time as well. After the introduction of the sewing machine, the work and time are minimized into quarters. It provides a great benefit to textile Industry especially in the leather field where the manual sewing concept was almost diminished. Can we ever imagine of having only two outfits? That is ridiculous right! however, people use to have only two outfits, one is for office and the other is for the weekend purpose since stitching a normal pant would require more than three days. Just imagine about a textile and leather industries, how miserable it would be for them. Thus, After the invention of the sewing machine, it becomes a great problem solver to all the Industrialist and women. The Invention of sewing Machine paved the way for women employment. The middle-class homemakers were engaged in working in factories. Moreover, the time for stitching the cloths Were decreased due to the automation in sewing eventually resulting in the considerable drop in clothing prices. Sewing machines are used both for Industrial and household purposes, Machine that meant for the household purpose are great in design, compatibility, easy portability and weightless. In addition, several mechanisms like embroidery provisions are also included in the recent models. Unlike a household machine, the Industrial Machines are huge in size and speed to improve the productivity. Thus, the day is intended to show the gratitude for the invention of Sewing Machine which has created an Industrial revolution in the Clothing industry. Try to learn basics of sewing. join sewing courses and become excel in sewing. You can choose sewing as a profession since it has a great demand nowadays. Post your ideas of sewing using this hashtag #SewingDay on social media. Provide tips to learn easily. Post your own stitched dress if any, using this hashtag #MyStitch. Explore more about the origin of the day, post as a comment in our website and your cooperation is very much appreciated. In 1790, I Thomas Saint is reported to be the pioneer in the sewing machine. He patented and invented the Larger size machine, which was meant only for leather materials. However, he failed to exhibit his invention resulting in the trueness of the invention and the working condition. In around 1814, Josef Madersperger, an Australian tailor developed and presented his working sewing machine that garnered positive acclaim and the Australian Government offered him with monetary aids to further improvise his machine. Nonetheless, technically, he failed and it remains a failed experiment. The first used machine was patented by French Tailor, Barthelemy in 1829. His patent was immediately approved and he founded a factory. However, the factory was set ablaze by the workers due to the fears over their future life in case of loss of employment. In the United States, the first machine was invented by lohny Greenough in the year 1842. However, the widely used machine was built by Issac Merritt Singer, Founder of the famous Sewing Machine Manufacturing Company, Singer, in 1851. However, the machine was patented by Elias Howe. He sued Singer for using his patent and finally awarded with monetary benefits from Singer and some other Manufacturers. Howe licensed the patent and the company ought to pay for using his patent. The electrical Sewing machines were built by Singer Sewing Company during the first world war gradually setting to motor machines. Even Now, Singer ranks one of the top most used brands in the Sewing Machine manufacturing. The origin of the day is uncertain.